With Bring Me Back you can easily save your current location and later find back to this place. For example, it will help you to find your parked car, your hotel or a nice restaurant you have seen during your trip. Can save multiple locations (the free version is limited to one location). The position of a place can be shared with others via email or SMS (not available in the free version). Intuitive 3D view of your route for best orientation. Route can be recalculated at any time with one tap. Displays your position, target position, distance to target and a direction indicator even if no route could be calculated, e.g. due to missing internet connection. If the location information is not available (e.g., because you are in a parking garage), the position will be autmoatically set for a place, as soon as the location information is available again. Places can be added as a tile to the start screen as as shortcut to immediately navigate to this place. Turn by turn directions, optionally spoken. 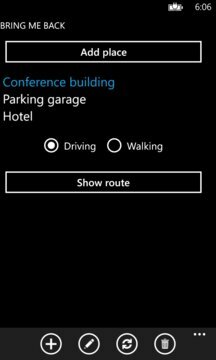 Say "bring me back to car" for example in your phones speech control and the app will immediately display the route to your car. Say "bring me back update position for car" for example and the position of the place named "car" will be updated with your current position. A status indicator shows you the quality of the location service (red = not available, yellow = available but not accurate, green = available and accurate). 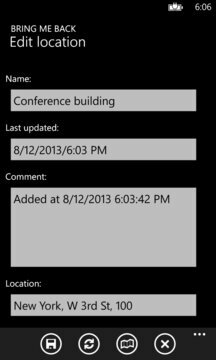 Supports all views of the Windows Phone map (road, aerial, both road and aerial and terrain). Optionally starts a navigation app or HERE Transit to guide you with public traffic means (must be installed separately). Highly configurable to suit your specific needs.